Prior to assuming his present position as the Director of the African Presidential Center at Boston University, Ambassador Charles R. Stith presented his Letter of Credence as Ambassador Extraordinary and Plenipotentiary of the United States to the United Republic of Tanzania in September 1998. He served as the Ambassador in the traumatic period after the August 1998 bombing of the United States Embassy in Dar es Salaam. Because of his able and steady leadership, the Embassy emerged from the bombing stable, and set a new standard for U.S. Embassies promoting U.S. trade and investment in Africa. Stith worked with the Tanzanian government to enable them to become the first Sub-Saharan African country to reach the decision point for debt relief under the enhanced Heavily-Indebted Poor Countries Initiative (HIPC). the Council of American Ambassadors. Ambassador Stith is the author of For Such a Time as This: African Leadership Challenges (APARC Press, 2008) and Political Religion (Abingdon Press, 1995). He is also the Senior Editor of the annual African Leaders State of Africa Report and author of many articles, which have appeared in such publications as the African Business Magazine, Wall Street Journal, Denver Post, Atlanta Journal Constitution, Boston Globe, the Boston Herald, USA Today, Los Angeles Times, New York Times, and the Chicago Sun Times. Ambassador Stith is a graduate of Baker University, the Interdenominational Theological Center’s Gammon Theological Seminary in Atlanta, and Harvard University Divinity School (Th.M). He is the founder and former National President of the Organization for a New Equality (O.N.E. ), which focuses on expanding economic opportunities for minorities and women. Most notably during his tenure at O.N.E., he helped negotiate and broker the first comprehensive community reinvestment agreement in the country. The agreement committed Boston financial institutions to $500 million in mortgage and commercial lending to low- and moderate-income and minority communities in Massachusetts. He later served on the CRA Regulatory Agency Working Group, chaired by then Comptroller of the Currency Eugene Ludwig. He was one of the architects of the regulations redefining the Community Reinvestment Act (CRA), which has resulted in nearly $2 trillion in credit and capital for low- and moderate-income communities and communities of color. 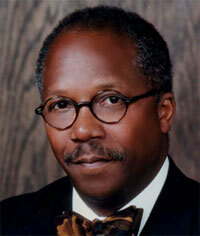 Prior to heading O.N.E., he was the Senior Minister of the historic Union United Methodist Church in Boston. He was an appointee of then Senate Minority Leader Tom Daschle to the U.S. Commission on International Religious Freedom. In addition, he has been an adjunct faculty member at Boston College and Harvard Divinity School. He has served on the National Advisory Boards of FannieMae and Fleet InCity Bank, the editorial board of WCVB-TV, and the boards of West Insurance, Inc. and the Wang Center for Performing Arts, among others. He is the recipient of honorary doctorates from the University of South Carolina, Elizabeth City State University, Clark Atlanta University, Interdenominational Theology Center, and Baker University.